ASU women's basketball team celebrates its win by ringing the bell after a game against Washington at Wells Fargo Arena in Tempe, Arizona, on Friday, Feb. 2, 2018. 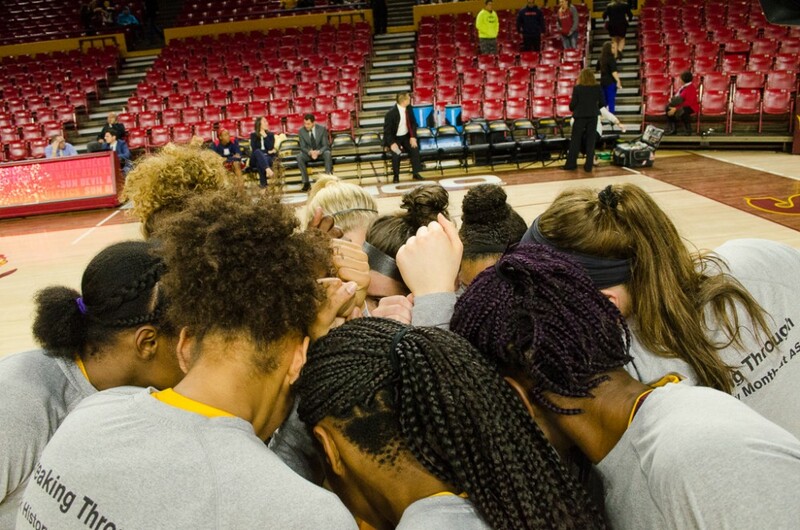 The ASU women’s basketball season might have ended in the Round of 32, but the team has the ability to dominate the conference next season with veteran leadership and a healthy roster. The Sun Devils have successfully reached five straight 20-win seasons and won an NCAA Tournament game without their third leading scorer, junior guard Sabrina Haines, who didn't lose a year of eligibility due to her injury. Head coach Charli Turner Thorne talked about what she wants to see from her team over the summer for the upcoming season. The Sun Devils finished sixth in the conference, but they proved critics wrong and reached the semifinals of the Pac-12 Tournament and made it to the Big Dance. The Sun Devils were overlooked as they entered the 2017-18 season with a young roster. The team consisted of no senior leadership, and it had to find a way to fill the shoes of the four seniors (Sophie Brunner, Quinn Dornstauder, Kelsey Moos and Sara Hattis) who graduated from the program. For the upcoming season, a healthy roster and the addition of three freshmen can put the Sun Devils over the hump and turn them into a dangerous team. The 2018 roster will feature four seniors (Sophia Elenga, Courtney Ekmark, Charnea Johnson-Chapman and Kianna Ibis) and will add three freshman to the team. Freshmen guards Taya Hanson and Jamie Loera can learn and develop under the likes of upperclassmen Reili Richardson, Kiara Russell, Robbi Ryan and Haines. For freshman forward Jayde Van Hyfte, she will be put under the wings of Ibis and Johnson-Chapman. Turner Thorne said that the team's guard depth could also see more small ball in the upcoming season. Turner Thorne believes the Pac-12 conference is the best conference no matter what the RPI or other categories say. The Pac-12 conference sent six teams to the 2018 NCAA Tournament, which ranked the conference third as the ACC (8), SEC and Big Ten (7) sent more teams. Turner Thorne said that the conference is unbelievably good and the Sun Devils want to be at the top. Reach the reporter at sbemanue@asu.edu or follow @SebastianEman24 on Twitter.